My name is Sheilagh. I’m a TES award nominated UK based children’s Occupational Therapist. I have over 20 years experience in helping parents and schools improve children’s handwriting. I’ve written a few best selling books and spoken at leading seminars including TES Sen Show, OT Show and many more. Help with Handwriting is a place where I share my knowledge and resources with you on anything and everything to do with handwriting. The reason why I do this is that I want to make handwriting easy and fun for everyone – even those who say that they hate it! I became an Occupational Therapist in 1996 and I have never looked back. Before then I was a graphic designer and I think this is what makes me different. Today, I still use my problem solving and creative skills. However, I do this in a way that helps others to achieve their true potential. Occupational therapy is about helping people to lead independent lives. Sometimes children need a little extra ‘je ne sais quoi’ to help them reach developmental milestones. I have seen children who have struggled to write and I’ve helped them win school story writing competitions. And I’ve seen how by just changing the style of a pen I have increased a child’s handwriting speed by a whole year group. For those who need more than excellent handwriting worksheets, I offer services ranging from Skype sessions to home visits, to handwriting training for schools. I have a MSc, BSc OT (Hons) degree with over 20 years experience. As an Occupational Therapist, I am registered with the HCPC. I’m a member of the Royal College of Occupational Therapists and the National Handwriting Association. My prices are both fair and affordable. 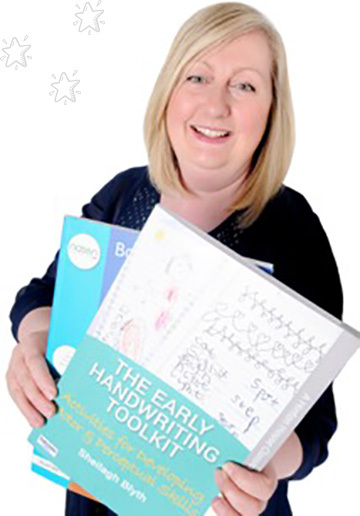 They range from just £13.75 to join my Get Set Write handwriting club, to £750 for a handwriting training course for teachers. Bev Evans Resource Author of the Year 2017. Featured in the Good School Guide, TES Special Educational Needs Show & more. I’m also the author of two books, one of which is a best seller. Most parents and teachers who consult occupational therapists know of a child that has a handwriting problem. Often it is possible for them to tell what the difficulty is but not how to solve it. Occupational therapy is a medical profession that uses scientific knowledge to identify the reasons why age expected skills are not being reached. We do this by looking at everyday activities e.g. handwriting. Identifying what developmental level a child is working at, before saying what area can be improved. The aim of occupational therapy is to enable and to empower children to achieve their functional best both at home and at school. It is possible to treat a wide variety of difficulties and thus improve handwriting. These include helping determine a preferred hand dominance, showing them how to form letters, improving letter legibility, teaching how to use spaces between words, how to write on the line and how to write at speed. As an Occupational Therapist with over 20 years of experience, I am able to assess and treat almost any handwriting problem. I can help improve handwriting in a number of different ways for different groups of people. To keep things easy to understand I’ve split my services into groups, click the button (below) that best describes you.